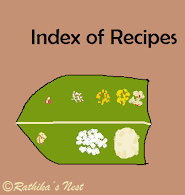 Though I have posted more than 130 recipes on this site, not many ‘masala powder’ recipes have been covered so far. Hence, I decided to post a couple of home-made masala powder recipes today! Sesame is an oilseed rich in protein, minerals especially copper and calcium, vitamins and dietary fiber. In Ayurveda sesame seeds are used to treat gastro-intestinal problems like indigestion, colic and spasm, and menstrual problems such as painful periods. Sesame chilli powder (எள் மிளகாய் பொடி) is a variant of idly chilli powder (இட்லி மிளகாய் பொடி) and it has the wonderful flavor and taste of sesame. This powder mixed in oil or ghee can be served with idly or dosa, either alone or along with chutney or sambar. Masala powders are best made at home as they can be tailor made to suit our taste. Note: The ingredients given above make the powder medium spicy. You may adjust the quantity of red chillies depending on your taste. Method: Remove the stalk of red chillies. Heat a kadai and roast red chillies, urad dhal and Bengal gram dhal till the dhals become golden brown in color. Transfer the fried ingredients to a bowl. Roast sesame seeds on medium flame. The seeds start to sputter and the nice aroma of the roasted sesame wafts the air. Switch off the stove at this stage. Transfer the roasted seeds to the bowl. DO NOT use oil for frying the ingredients. Cool to room temperature and grind them with salt into a medium fine powder using the mixer-grinder. How to store: Allow the powder to cool and then store it in a clean, dry, airtight container. Always use a dry spoon. If stored and handled properly, sesame chilli powder remains fresh for at least two months.Sesame chili powder mixed with gingelly oil or ghee makes a great accompaniment for idly or dosa.